Last week I went to the most charming city of all, Charleston, SC, and I completely fell in love!! Breaking this blog down so it’s very easy to read the MANY aspects of my trip I want to share. Hope you enjoy!! Well, it’s been on my list of places to go and I had one week off from school. I knew I wanted to take advantage of my time and go somewhere and Charleston seemed to be the perfect option- cheap flights, relatively close, and small enough city to see in several days!! NO ONE!!! Just me! I’ve never traveled solo and let me tell you, it was AMAZING. I was very excited but I can’t lie, I was also extremely nervous before getting there. I knew I was capable of doing it but still, it’s something new and ah! Well, if you’re ever on the fence of just booking a flight and going solo, DO IT. Do not hesitate AT ALL. Pros and Cons of traveling alone? There are no cons. Pros: you can do whatever you want, whenever you want, however you want. You don’t have to wait on anyone. You don’t have to spend time in places you’d rather not. You can spend the whole day doing EXACTLY what you want. The absolute best part of traveling alone is how much it forces you to step outside your comfort zone and make conversations with people. If I had gone with friends, I wouldn’t have met half the people I did. You get to talk to locals, other tourists. Luckily, I stayed with a friend! Thank you, Danielle!! Plenty of Airbnb’s!! Ha! All the amazing people I would strike up conversation with, I would also ask them to take some photos of me! Some of my best photos I’ve ever shared were from this trip. I’ll write a blog post about how to ask/direct strangers on taking the perfect photo sometime soon! Overall, what do I think of Charleston? It’s the best of all worlds. Truly. You have the “city” which to me was more of a very charming town, extremely walkable! You have a ton of history. You have beautiful open land right outside. and best of all, you have the BEACH just minutes away. I could definitely see myself moving here one day!! Start your day at GLAZED GOURMET DOUGHNUTS– the chocolate and raspberry doughnuts were delish!! Since you’re on King Street, start walking down it, and just take a second to admire the colors of the city, details of each corner, and most of all, the greenery and flowers! Stop in at Candlefish to see the most aesthetically pleasing store EVER. They make candles, and sell everything imaginable! I know you had doughnuts and probably coffee, but now you should stop in at The Rise Coffee Bar for more coffee and breakfast treats! Loved this place! I would definitely spend my mornings here if I lived in Charleston! Continue on walking down King Street with coffee in hand and phone/camera in the other! Every home is more beautiful than the one before. Stop in St. Michaels Church if you want to have a peaceful moment, or just look at a gorgeous church! At the end of King Street you’ll run into the Battery! Stand on the corner of the sidewalk and turn 360 to just admire everything around you. Once you’ve snapped away, cross the streets to your right (toward water) and start walking! You’re bound to hit Waterfront Park! The Pineapple Fountain is located in this park! Continue walking up! Head over to the Charleston City Market for some cute souvenirs or local products! Note: there are multiple buildings, keep walking through! Towards the end of this day, I just started walking through alleys and back over to Meeting Street and then King Street. Get ice cream at Jenis! This was basically my dinner since I had lunch pretty late in the day but many dinner options in this area!! Ended my day with sunset at Folly Beach!! SO GORGEOUS. GO. Get up and head over to Callie’s Hot Little Biscuit for fresh made biscuits and coffee!! It’s a tiny place so BEWARE but so worth it!! 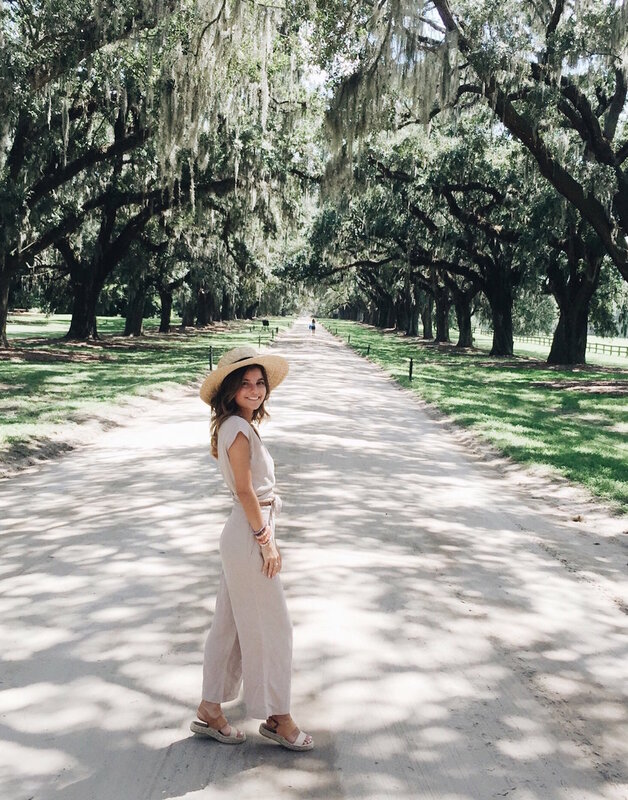 From here, take an Uber or your car if you have one, and head over to Boone Hall Plantation & Gardens! This piece of property is absolutely breathtaking and coolest part- It’s one of America’s oldest working farms! Sign up for the house tour when you get there or call ahead! If you have time, take the bus tour around the property (free) and then continue exploring the land by foot! Also, look to see if there are any events happening during your stay! After Boone Hall, catch a ride to Pitt Street Bridge if you want to walk a really pretty walkway over marsh land! It was scorching BUT gorgeous! Okay you’re probably hungry by now!! Head over to Poe’s Tavern in Sullivan’s Island! They’re known for their burgers so get one! Once your tummy is happy, change into your bathing suit and walk over to THE BEACH!!!! Stay here until sunset and then grab delicious but very expensive ice cream at Beardcat’s Sweet Shop. I got the mixed berry and espresso! YUM!!!! Started my morning at Black Tap Coffee so dang cute! Got the lavendar iced latte which was delicious with a warmed chocolate croissant. Seriously it left me speechless. Then I decided to walk down King Street again, this time stopping into the many boutiques I didn’t allow myself to stop in before. Walked down to the battery and then back up E Bay St.
Had lunch at PawPaw – get their froze, so yummy! I was also recommended the fried chicken which was amazing and Brussels sprouts and tuna tartare! I then walked up several blocks and took the ferry taxi for a ride! Adult 1 way tickets (if you just want to go for a boat ride) was $12! It ended up pouring on this ride so I hopped off at the downtown location and took an uber up to a coffee shop! The Daily coffee shop is north King St- a little ways away from mainstream activity but really cute! Then I went to The Darling Oyster for a drink and oysters! 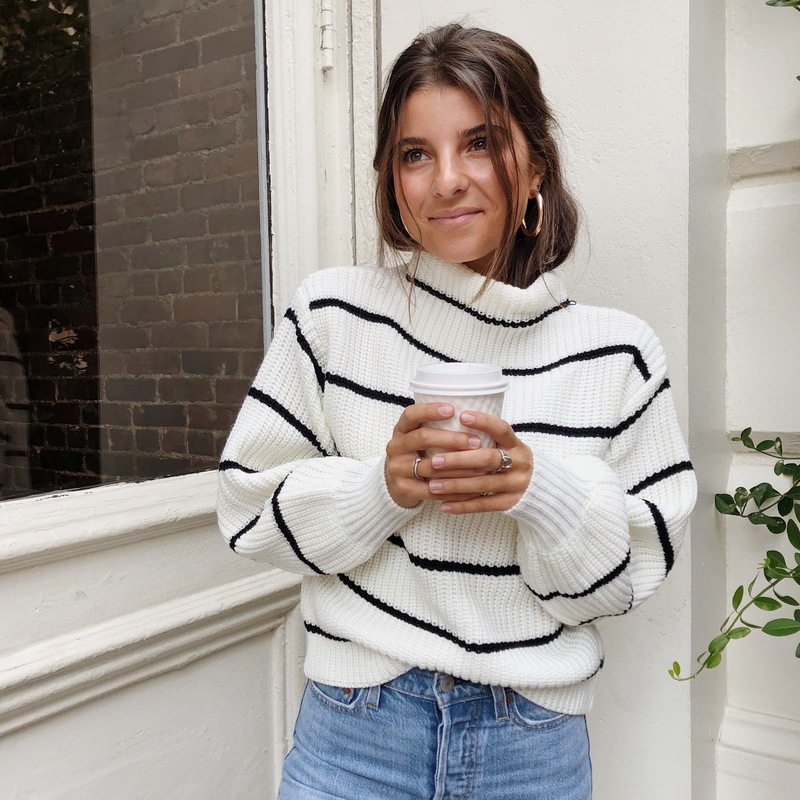 – get the Paloma drink! Below is most of everything I wore! Click through photos to find what you’re looking for! I am off to go continue celebrating my birthday with my family in Rhode Island! So excited! Below are the many photos I took in Charleston. Let me know if you have any questions!! Have a beautiful Labor Day Weekend! !